Seconds into “I Love Lucy: Live on Stage,” you forget you’re watching actors other than Lucille Ball, Desi Arnaz, Vivian Vance, and William Frawley playing the iconic quartet of Lucy Ricardo, Ricky Ricardo, Ethel Mertz, and Fred Mertz. The cast and the staging by director Rick Sparks remain so true to the original, you can believe you are sitting at Desilu Playhouse in Hollywood circa 1951 witnessing the taping of an “I Love Lucy” episode. Sparks and his co-adapter for “Lucy,” Kim Flagg, make good use of the “You are the audience” gambit. Mark Christopher Tracy comes out for the warm-up and speaks just as you would expect an emcee to do 60 years ago. You can hear the tone and language of introductions by television and radio announcers of the 50s. The congenial, subtly condescending, patter also matches what you see in movies that include emcees talking about acts or interviews in the style of Louella Parsons and Hedda Hopper. The closest thing to it today is the “Ladies and Gentlemen, Boys and Girls” opening that is a fixture at all Disney theme parks. Flagg told me in an interview that CBS was strict about the “I Love Lucy” scripts. They had to be done exactly as they were written. CBS also insisted that all sets be true to those familiar with the Ricardo living room and Ricky’s Tropicana nightclub, a point that did not have to be stressed because Flagg and Sparks always intended to make the “Lucy” experience as authentic and realistic as possible. “Lucy” episodes are 22 minutes in length, the standard running time for a half-hour program to leave room for commercials, credits, and other announcements. To create a show that would give theater audiences 90 minutes of entertainment, the writers included commercials from the period. You get to hear jingles for Brylcreem, Mr. Clean, Chevrolet, and others in their entirety. (I’m not sure Mr. Clean was on the market in 1951, but it was fun to hear his song.) The Chevy commercial is led by Sarah Elizabeth Combs as a singer called Dinah Beach (Mwah!). Another, for cold cream, proves the purity of the product by using a Geiger counter to check for radioactivity inferior creams leave behind in women’s skin. Most of the jingles and other musical interludes are done by an ensemble that Sparks and Flagg dub The Crystaltones. They rekindle the Modernaires and others of the “Lucy” era. Musical numbers abound in the “Lucy” episodes. Both programs chosen, “The Benefit” and “The Eye Doctor,” involve Lucy trying to break into show business, so you see Lucy jitterbugging, Ethel and Fred doing “The Varsity Drag,” and Ricky in all his Latin glory in “Babaloo.” Flagg and Sparks were smart enough, and I imagine, clever enough to get CBS to approve the interpolation of musical bits from other episodes. This gives the ensemble the chance to do a funny number as peasants and extend the running time of the “Lucy” shows. The “I Love Lucy” Live on Stage” cast is remarkable. Close up, none of the performers look like Ball, Arnaz, Vance, or Frawley. With wigs, make-up, and the distance the stage adds, three of the four pass immediately for the bygone stars they are playing. The fourth, Kevin Remington as Fred Mertz, is a bit shorter and stouter than Frawley, but, like his castmates, he has the voice and physical traits of Frawley’s Fred down pat. I do not want to give the impression the actors are imitating the “Lucy” characters. Part of the charm of “Live on Stage” is how well the cast conveys all the traits of “Lucy’s” nuclear four while staying natural and within themselves. You believe you’re seeing Ball, Arnaz, and Vance, but that’s because of the artistry of Sirena Irwin as Lucy, Bill Mendieta as Ricky, and Joanna Daniels as Ethel. Remington also makes you forget the differences between him and Frawley because he is so identifiable, trait by trait, as Fred and because, like his castmates, he is shrewd about getting the trick of his character’s voice — Frawley’s voice, in Remington’s case — and portraying the physicality of the character just as the quartet that has been in reruns for decades has done. Irwin has every Lucy move, whether it comes from Lucy Ricardo or Lucille Ball, down to a tee. Even her dancing is spot on like Lucy’s. I felt every minute of “Live on Stage” that I was watching Lucille Ball in action. Irwin looks right in Lucy’s clothes. Although in real life, she is a blond, the red wig and big eye makeup suits her coloring. Beyond the looks, that can be accomplished by hair and wig designer Diane Martinous or costumers Shon LeBlanc and Kelly Bailey, is Irwin’s main gift — Lucy’s timing. The woman doesn’t miss a beat. Her comic clock is set to Ball’s rhythms and line readings. This is a gift that has to be instinctual. It can’t be rehearsed or practiced with such precision. 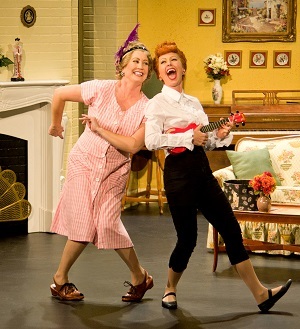 Even when Irwin steps out of character to be Lucille Ball, as opposed to Lucy Ricardo — while greeting the audience or doing a staged ‘flub’ bit — she retains the essence of Lucy. The teacher was right. Irwin proves as versatile as Ball by, in the 44 minutes allotted her, showing comic ability, musical prowess, including singing off-key in the manner of Lucy Ricardo), and even moments of seriousness, e.g. when she is concerned about Ricky’s headaches and forces him to go to the eye doctor. Bill Mendieta masters once of the more difficult parts of portraying Desi Arnaz — his accent. Yes, the accent becomes a source of comedy, and a reliable one. But, Mendieta does it with perfection while also capturing Ricky’s leadership role and knack of being on to Lucy’s antics while remaining curious enough to see how they play out before he stops them. Like her castmates, Joanna Daniels channels the original, Vivian Vance, and plays Ethel with the same naturalness as the originator. I especially enjoyed Daniels when she’d played Ethel as the chairman of a benefit. Suddenly, she takes on flowery language spoken in overarticulated tones, and it’s very funny. I remember Vance doing the same. To this day, I can’t say “get a load of….” without imitating the way Ethel says it in the episode in which she and Lucy go to charm school. Daniels is also a true song-and-dance star. Her numbers with Remington and Irwin are lots of fun and show the true vaudevillian verve Ethel would have. Remington is a great Fred, greater because he does not resemble William Frawley and can’t be mistaken for him. Flagg and Sparks knew their business. They open the first episode, “The Benefit” with the Ricardos and the Mertzes playing bridge in the Ricardo living room. The set, put together by Aaron Henderson, is just as you might remember it, but in color. Flagg and Sparks were also shrewd in choosing episodes that had a lot of performance and that gives both the nuclear cast and the Crystaltones a lot to do that shows off their musical theater and comic ability. Irwin and Mendieta, in particular, show a range of talent. Irwin gets to do Lucy singing loud and flat in what is supposed to be a four-part harmony with the Mertzes. She gets to catch on as Ricky chooses a tune, “Auf Wiedersehen” in which Lucy’s only role is to sing the word “Auf.” She can lay aside Lucy Ricardo’s lack of musical talent by singing for real in “Under the Bamboo Tree” and show off Lucille Ball’s dancing ability in two great jitterbugs, one as the number is supposed to be done, one mangled (by Lucy’s vision being clouded from drops the optometrist puts in her eyes). The pair is also great in a bit in which Lucy co-opts all of Ricky’s jokes in a comedy routine and turns the tables by making him the straight man instead of the comic. Mendieta proves he can be a Latin entertainer with a rousing “Babaloo.” Daniels and Remington cut a mean rug in their song-and-dance sequences. The fun in “I Love Lucy: Live on Stage” is old-fashioned and nostalgic. You have to go with the flow and enjoy the commercials, the behind-the-scenes activity, and the 50s veneer of television being new and special and seeing “I Love Lucy” being shot live a particular thrill. The authors take some liberties with anachronisms, but most of the songs the Crystaltones sing are from the charts of 1951 and 1952. It is clever when Jeffrey Christopher Todd, playing a stage manager, admonishes people to turn off their transistor radios and refrain from using those new Kodaks that let you take photos indoors. Mainly, the joy and satisfaction comes from watching a talented cast play “Lucy” episodes before your eyes. “I Love Lucy: Live on Stage” is a gimmick of sorts, but it is also a labor of love, and the affection America has had for Lucy and all the Ricardos, Mertzes, Magillicuddys, Applebees, Trumbulls, etc. for 60 years shines through. The entire cast ends the show by singing the entire “I Love Lucy” theme song, and its lyrics ring as true as ever. “I Love Lucy: Live on Stage” runs through Sunday, Dec. 29 at the Merriam Theater, 250 S. Broad Street, in Philadelphia. Showtimes are 2 p.m. and 8 p.m. Saturday and 1 and 6:30 p.m. Sunday. 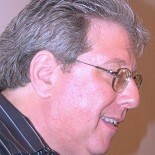 Tickets range from $75 to $25 and can be obtained by calling 215-893-1999 or going online to www.kimmelcenter.org. This entry was posted on December 28, 2013 by nzoren in Theater Reviews and tagged Babaloo, Comedy, Desi Arnaz, Ethel Mertz, Fred Mertz, I Love Lucy, I Love Lucy: Live on Stage, Kim Flagg, Lucille Ball, Lucy Ricardo, musical, Nostalgia, Rick Sparks, Ricky Ricardo, Vivian Vance, William Frawley.